Made of elegant navy blue velvet, this challah cover symbolizes the sacred beauty of the holy day of Shabbat. The Sages have taught that the holiness and tranquility of Shabbat, for those who honor and keep its proper sanctity, will merit experiencing a morsel of the World to Come in the Shabbat. 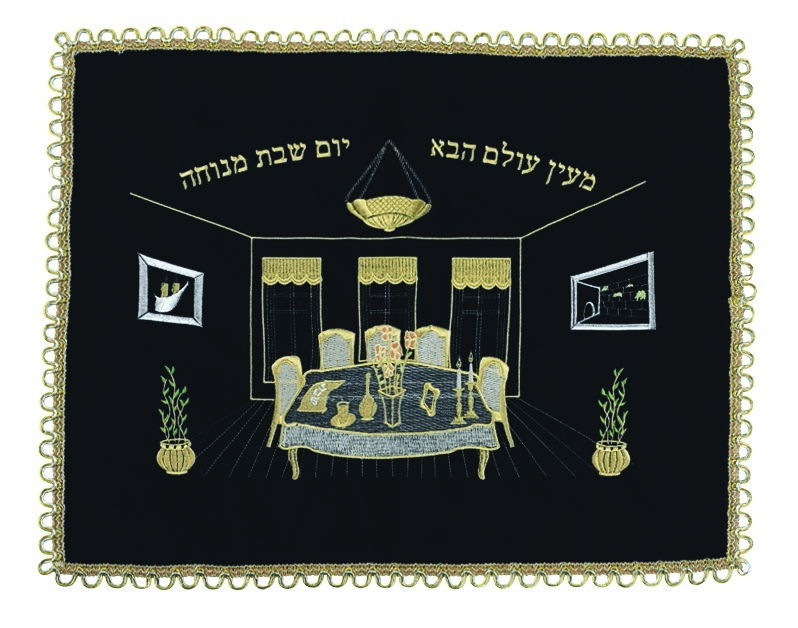 The challah cover depicts the tranquility of the Shabbat with a set Shabbat table and peaceful surroundings. Two plants on the side add green coloring to the all gold colored artwork. The Hebrew words from the Shabbat zemirot, “Me’en olam habba – Yom Shabbat menuchah” , “A bit of the World to Come – Shabbat the Day of Rest”, is embroidered across the top in an arch shaped design. The edges are finished with gold arches.